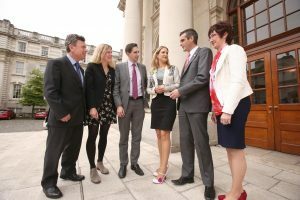 IFA President, Joe Healy and Farm Family & Social Affairs Chairperson, Maura Canning this week met with Simon Harris, Minister for Health and Helen Mc Entee, Minister of State for Mental Health and Older People to call for the charge on productive assets in the Fair Deal Scheme to be reduced to reflect ability to pay in order to protect the viability of the farm for future generations. Mr. Healy said that the current financial assessment is fundamentally unfair as it has the greatest impact on the lower income farms, where any further dilution of assets could render the farm non-viable for future generations. He said that the farm is a productive asset that is required to generate income, it is not a measure of ability to pay. “I am calling on the Minister to introduce a progressive financial assessment system that reflects the value of the asset and the income generating capacity in order to the protect Ireland’s family farm model”, said Mr. Healy. “The financial liability on farms that have been transferred must be reduced from five to three years as it is inhibiting young famers from making the necessary investments in farms to increase productivity and competitiveness”. Mrs. Canning said that the current system is causing significant stress for older people and farm families at an already very difficult time. She said that many farm families are choosing not to avail of the scheme and putting themselves under severe financial and emotional stress to try to find the money to pay for the cost of care in the short term. “The definition of sudden illness or disability, which can apply a cap of three years on the farm asset under certain circumstances, must be broadened”, said Mrs. Canning, “It must also include those who have been cared for at home for a short period, but subsequently require care in a nursing home”. Mr. Healy stated that IFA strongly support the lifetime transfer of the farm, however this is not always possible. He said we must have a scheme in place that does not undermine the viability of farm business for future generations. At the meeting both Ministers reiterated the commitment to in programme for the new partnership Government to introduce changes as soon as practicable to remove discrimination against small businesses and family farms as per the. IFA has be invited to make a presentation at the next Interdepartmental/Agency Working Group meeting on the 8th September 2016.